Recovery is slow and demographic trends suggest a bleak future. Shortly after the 3.11 disaster along the northeastern coast of Japan, numerous members of the media descended on the area to cover the disaster and report on the response to the devastating situation locals faced. While a great deal was written and broadcast for a few weeks following the tsunami, media attention waned and relatively little has been written about the post-disaster recovery process outside of Japan. While conducting research this summer on small businesses in the Tôhoku region, I had the opportunity to spend time touring the cities of Ofunato, Kesennuma and Rikenzentakata – some of the areas worst hit by the disaster. A visit to these places remains quite sobering. On the one hand, the extent to which debris has been removed is amazing. 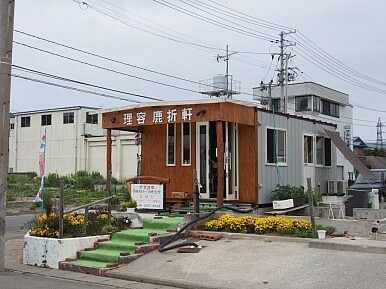 Cities like Kesennuma at first glance show few signs of the disaster. Along the wharf, new buildings have been erected for the fish processing industry and boats float in the harbor. But look a little more carefully, and the scars remain visible. 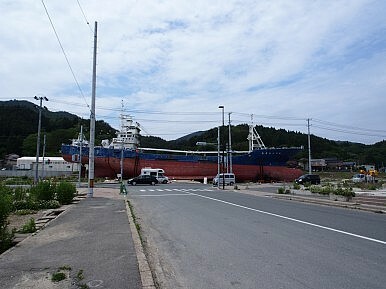 A large tuna trawler still sits awaiting demolition along the side of a road slightly inland from the waterfront, and a business and residential neighborhood near the harbor remains vacant for the most part. In this neighborhood two houses have been rebuilt and there is a lone barbershop that opened only four months after the tsunami. The barber operates in a temporary structure that has been decorated with flowers and wood trim. Driving further up the coast to Rikuzentakata still brings one face-to-face with the extent of the destruction. The downtown area is gone; it’s now nothing but a collection of vacant lots with the remnants of streets and sidewalks running between. There are no buildings other than the shells of two that somehow survived the deluge. While the roads remain, the train tracks were washed away. And there is no sign of reconstruction. Dump trucks continue to haul away debris, but nothing has been built in place of the city that once stood there. This is in part a result of the fact that there is concern about returning to the area for fear that another tsunami might hit in the future as well as ongoing discussions and debates about what to do with the area. Many locals continue to struggle as they deal with post-disaster life. One man, who runs a hotel in Kesennuma that sits on a hill overlooking the harbor where the tsunami destroyed everything, told me that after the tsunami hit he opened his doors to refugees and about 200 people stayed at the hotel for a few months. There was damage to the building from the earthquake, but the government has been slow to provide funds to help with repairs, so they can only incrementally fix small areas of the hotel that were damaged. Can the US Solve Japan’s Energy Crisis? Importing natural gas from the U.S. could give Japan the energy security it seeks.